It doesn’t matter how amazing they sound, or how flawlessly they cancel noise; your fancy headphones are all but useless if they’re too clunky to actually carry around. Inspired by the metal links on a watch strap, the MKo1 Roller from Luzli feature a neat head strap design that can be rolled up tight and compact for easily stashing in a bag. What’s not quite as neat is the headphone’s obscenely expensive price tag and limited functionality. If you’re in the market for a new pair of ear goggles, Sony’s pricey WH-1000XM3 headphones are currently the pair to beat, with wireless connectivity, excellent sound quality, and amazing noise-canceling performance. They fold for easier storage but pack away into a relatively chunky case which can be problematic when you’re trying to maximize the capacity of a carry-on bag. 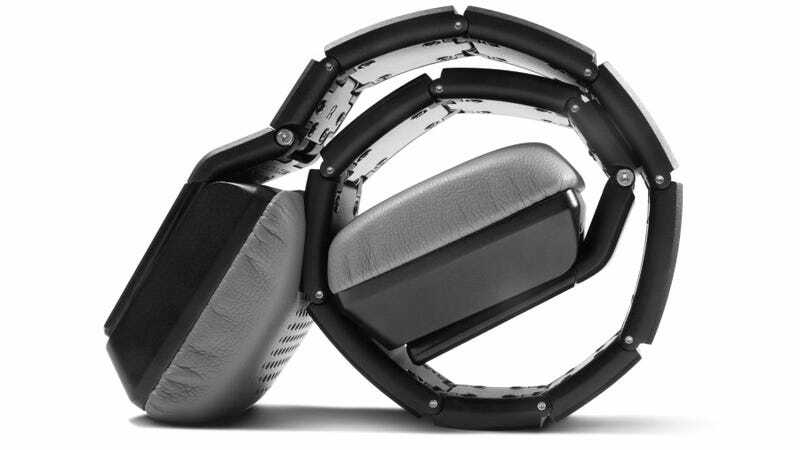 Luzli claims its MK01 rolls smaller than all other on-ear headphones currently on the market. That’s certainly notable, but a claim that comes at the cost of several other useful features. The $3,960 MK01 Rollers—which are actually the cheapest headphones that Luzli currently sells—aren’t wireless, and don’t feature any kind of electronic noise-canceling. Their on-ear design also means that there’s no minimal natural noise-blocking happening, either. Even the cheap white earbuds that come bundled with your iPhone will do a better job at blocking unwanted sounds when worn. Luzli also boasts its headphones are made from premium durable materials like aluminum and stainless steel, and the soft earpads can be easily replaced when they wear, which means the MK01s could potentially last you a lifetime. But with more and more devices ditching the headphone jack, you probably won’t actually want to keep them around that long. Even if you think wireless is doing a disservice to your music, you can get a pair of excellent Sennheiser HD 800 S headphones for less than half the price of what the MK01 Rollers will cost you. A nifty headband trick just isn’t worth as much as Luzli thinks it is.